At the end of last year I signed up for The Age’s ‘Clique’ photo competition. Basically each month they provide you with a theme and you have to submit a photo on that theme. I was relatively happy with my submissions for the first two themes (‘water’ and ‘building’), but I was really happy with my one for ‘shine a light on what matters to you’. Today I found out that it was a finalist in the competition, and while I didn’t win or get a highly commended it was awesome to have my shot rated so highly by the judges. A really good picture tells a story…but sometimes the story behind taking the picture can be just as interesting. Now the idea was to take a photo of something that mattered to you. Which is pretty much code for ‘take a picture of something that will make you look better by showing you care about it’, so I figured there would be a lot of photos about the environment and about poverty. While these things definitely matter to me…I wanted to do something that was a little more positive. Seeing as I spend pretty much all of the time that I’m not working, sleeping or being a parent, training for the Ironman, I decided to take a photo of something to do with that. I’ve seen footage of me running, and that certainly isn’t an image I want to capture or share with other people…and taking a photo of myself swimming was probably going to result in the loss of my camera, so I settled on a photo of me on the bike trainer. 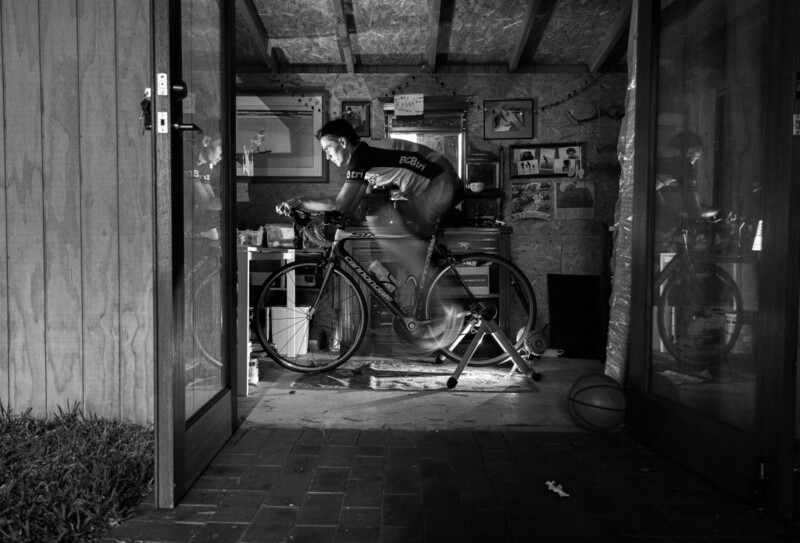 I wanted to take a photo with a slightly longish exposure so that there would be an impression of movement through my legs being a blur as they pedaled, and seeing as we don’t have any lights in the shed where I train I figured that a long exposure would also allow a lot more light in. So my plan was to set up the shot by getting Josh to sit on the bike so that I could get it framed and focused, then shoot the photo with 10 second timer so that I had time to run over to the bike and start pedaling. But when I got everything set up in ‘Manual’ mode on the camera it would only allow me to set a 2 second timer, which was not nearly enough time for me to get onto the bike. So I could either use a different mode on the camera and let it do the work…or I would need a camera assistant. Seeing as my main reason for joining ‘Clique’ was to get better at using the manual settings on the camera, I opted for getting a camera assistant to press the button to take the shot. Regrettably the only camera assistants available were a 12 year old Beagle/Labrador and an 8 year old boy. I went with the 8 year old boy (and anyone who uses this quote out of context against me is a terrible person!) Now 8 year old boys have many redeeming features, however sitting next to a camera, waiting for their Dad to scamper over to a bike and say ‘now’, pressing a button, waiting for Dad to unclip from his pedals and scamper back to the camera to review the shot and then say ‘that was good but I need you to do it again’ and then repeating this 15 times when they would much rather just play on the monkey bars is not one of them. Pressing a button on the camera without also moving the camera is also not really in their repertoire…and neither is staying really still while the camera is taking the long exposure. On the bright side, being brutally honest about whether you should have a top on for the photo is a real strong point. The reality of using these bike trainers is that you do a whole lot of exercise without any real air flow, so you sweat a hell of a lot…so I normally do these sessions just wearing my cycling knicks. But with the innocence that has broken the heart of many a parent Josh inquired ‘Dad, are people going to see this photo?’ ‘I hope so’ I replied…and after a few seconds consideration ‘Well they probably won’t want to see you without your top on’ was his considered conclusion. So ‘capturing the moment honestly’ went out the window and the cycling jersey went on. After about 10 attempts the shot still wasn’t working. If I pedaled at a normal pace, then my legs were moving so fast that my legs disappeared with the long exposure. And the shot looked really flat. So I shortened the exposure, put my phone with the torch on at the bottom of the trainer and put my laptop in front of me so that there would be a bit of light on my face. After another couple of shots I had worked out that if I pedaled really slowly, then I got the effect of the blurred legs I was after. Unfortunately, my camera assistant worked out that he really didn’t want to do this anymore and so he headed off to do something else. To add some further excitement we were about 10 minutes away from when it was time to put the kids to bed. There was every chance that the entire night was going to be a waste of time, so I dragged Katie away from the kitchen and asked her to take the shot. Her first shot was almost perfect, so I excitedly made a few minor tweaks and saddled up for the winning shot…only to have my phone run out of batteries and lose the light at the base of the trainer. So Katie grabbed her phone and we went to try again…then the laptop ran out of batteries. So I raced it inside and charged it for a few minutes. Then with children who should be in bed revelling in the anarchy of not being in bed, with a laptop with about 5% charge and a phone with even less, and with any chance of actually doing a training session on the bike completely eviscerated, I saddled up for one last shot…and it worked!